Happy Thursday, everyone! Welcome to another edition of Fashionknitsta. Today I have a wonderful assortment of things I’ve been waiting weeks to share with all of you. First on the list is Shibui’s Retro Tailored Cardigan by Olga Buraya-Kefelian. I have to begin by thanking Sara for putting this up on the web for me, and then continue by apologizing to her for the harassment she has had to endure because I’ve been bugging her about this pattern since pretty much my first entry. I absolutely love this pattern and have been a teensy bit obsessed with it since the first time I saw it. It’s done in ShibuiKnits Merino Kid, which is a yarn I love the texture of and it’s reversible! Totally cute either way you wear it, I really really like the color the sample is done in (Honey), but I have always sort of imagined it in the back of my mind done in Midnight so that is a going to be a tough choice (especially since ShibuiKnits yarns are on sale through the 8th of November). Now, if you read last week’s post you might have noticed that I featured one of Olga Buraya-Kefelian’s patterns, the Akomeogi Tunic. I did not realize that both of these patterns were by the same designer until I sat down to write this post. I wish I had known before because she has a great collection of patterns she has designed on Ravelry and I really recommend you check them out. Aren’t they a perfect lounge around the house version? There are just so many options with these, they are so easily customizable using color and great buttons and how perfect would they be for holiday gifts?! These are done with a worsted weight yarn and a size 15 needle and then they are felted. 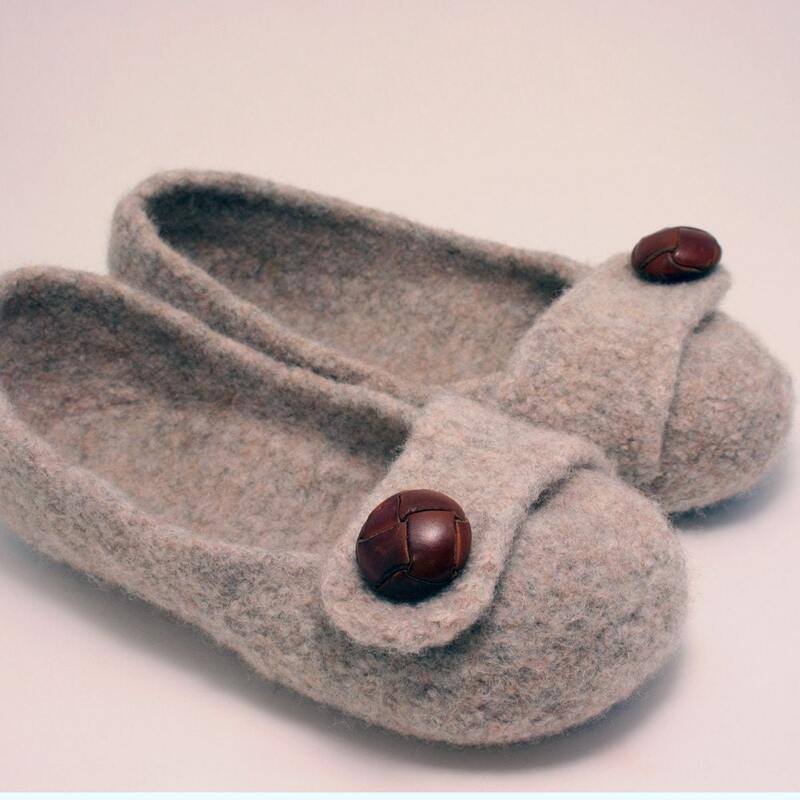 It looks like she uses Paton’s Classic Wool, but I think they would be great done in Lamb’s Pride Worsted for great color choices, or Joseph Galler Prime Alpaca doubled if you really wanted to treat your feet! The designer’s name is Melynda Bernardi and she has a great blog as well as a Ravelry account and I think both of them are definitely worth looking at. I just have to share this picture from her blog, I love it! Much like the Oleana Collar, this is a wonderful accent to complement a winter coat or just over a sweater. We were so excited to find Pam Powers, the designer, that I have been having a really hard time keeping quiet about this one. It can be done in an Aran or DK weight, and the original was made with Elsebeth Lavold Angora. I would really like to see it in Shibui Baby Alpaca DK. Sandy Kay just told me that she is on her second one using Art Yarns Silk Rhapsody, so I bet it’s just luscious. Coincidently, the Ruffled & Rouched Scarf is the featured pattern at our first Holiday Happy Hour, taking place next Wednesday, on the 4th of November from 5:30 pm-6:30 pm. If you attend the Happy Hour it costs $15 ($35 if you attend 3 of them), and we’ll walk you through the double-needle provisional cast on needed to start this beautiful piece. Attending the Happy Hour also gets you a 10% discount that evening (an addedl bonus), and there are a series of these evenings listed on our classes page. Be sure to register before they are full! And with that I leave you for another week, and hope everyone is enjoying the seasonal rain and staying warm. Until next time, stay chic blogfans! The post Fashionknitsta Thursday: 10/29/09 appeared first on Knit Purl Blog.